The Charles Rooking Carter Awards, were held at the Carterton Events Centre on Saturday evening, where the community came together to celebrate Carterton’s coolest people. 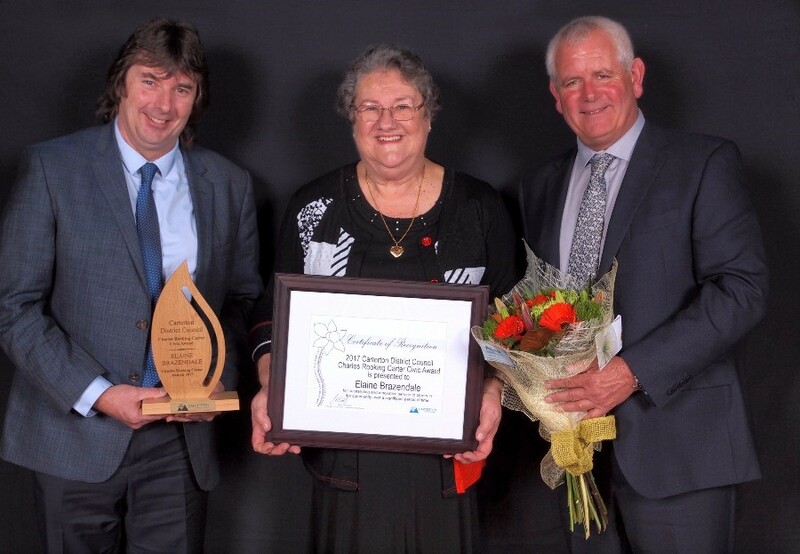 Elaine Brazendale won the prestigious Charles Rooking Carter Award, where she was recognised for the significant contribution she has contributed to the Carterton District. Sitting on Council for 6 terms, two of those as deputy Mayor, Elaine was involved with many exciting and challenging aspects of the District, including the Events Centre, the Carterton Community Courthouse Trust and more recently the proposed changes to local governance. In the past she was elected on to the Wairarapa Hospital Board representing Greytown and Carterton. Continuing down the health sector path, Elaine was on the Wairarapa Community Health Board as chairperson, chair of the Wairarapa PHO until it merged with Compass Health, and has been on the Compass Health Board in Wellington. Elaine has held positions at both Red Cross and St Johns and is passionate about both these causes. You won’t find Elaine at the front of the queue with the microphone, but at the back working quietly to achieve whatever needs to be done on a practical basis. Elaine is also involved with St Marks Church in lay ministry, and is on the St Marks vestry and vicars warden. Personally, Elaine and Winston have fostered nearly 40 children during their lifetime and are still in contact with many of them. A tremendous, selfless act by them both. If Elaine wasn’t busy enough, she is the Carter court Society Incorporated Chairwoman. The other five winners were, Elaine Renall (EnZed PC Services Voluntary Community Services Award), Dalefield Hockey (Allflex Achievers Award), Mende Biotech – Doug Mende (More FM Boosting Business Award), Rebecca Vergunst (Young Leader Award) and Kerry McGhie (Carterton New World Courage and Commitment Award). To view winners images and a full list of finalists please visit out Charles Rooking Carter Awards page.